OK. You probably know that I live where we have many, many woodpeckers. One of the most abundant woodpeckers in Oak Run, where I live, is the Acorn Woodpecker (Melanerpes formicivorus). 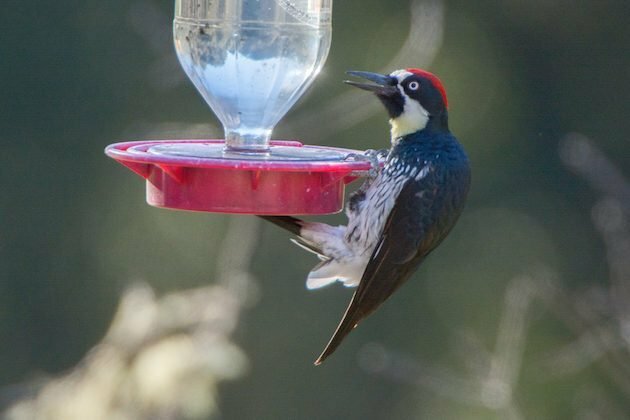 The photos above and below are an adult male Acorn Woodpecker hanging on a hummingbird feeder at the University of California Hopland Research and Extension Center where I attended a meeting back in February. You may also be aware that I have been feeding hummingbirds at my home for over thirty years now. 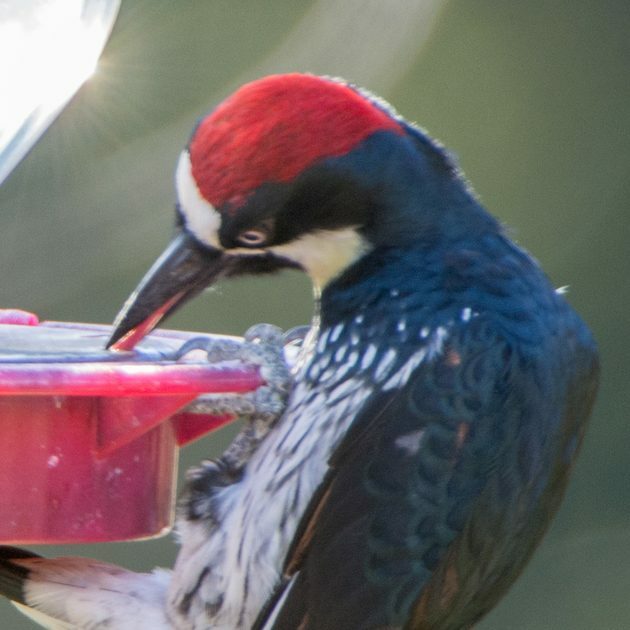 During all these years I have never had woodpeckers of any species feeding at my hummingbird feeders, so I found this very odd. This is a close-up of a male with his tongue in the feeder. Obviously his beak won’t gain access to these feeders. A couple of female Acorn Woodpeckers were not going to be denied their turn either. 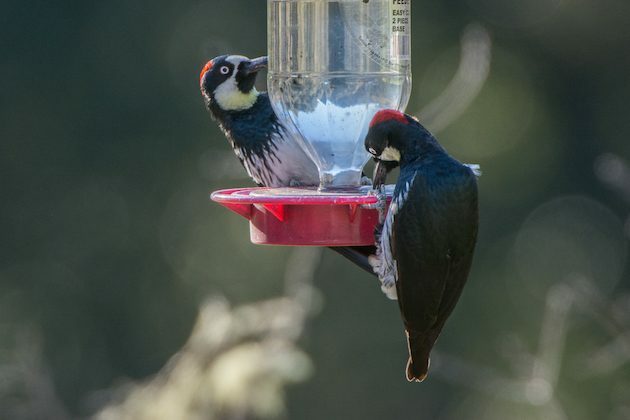 These woodpeckers were very adept at feeding from these hummingbird feeders and several of the people I spoke with at the meeting told me they had seen this behavior before. Odd I say. What say you? As a side comment, it should be noted that these hummingbird feeders have not been properly maintained. You can see the black spots on the inside of the feeders. This is most likely black mold. It is dangerous to hummingbird health and can actually kill the birds. If you don’t know how to properly clean your hummingbird feeders look here. Here in the lowlands of Arizona, Gila woodpeckers are the bane of people who feed hummers. They are constantly feeding at hummingbird feeders, tipping them to one side and causing the contents to drip out. Our gilded flickers will do the same (although they are much less common). These woodpeckers aren’t alone. There is one group of woodpeckers who specialize in feeding on sweet, syrupy liquids–the sapsuckers. It is probably a more common behavior among woodpeckers than is commonly realized. Thanks for the insight Tom. I had forgotten about the sapsuckers. 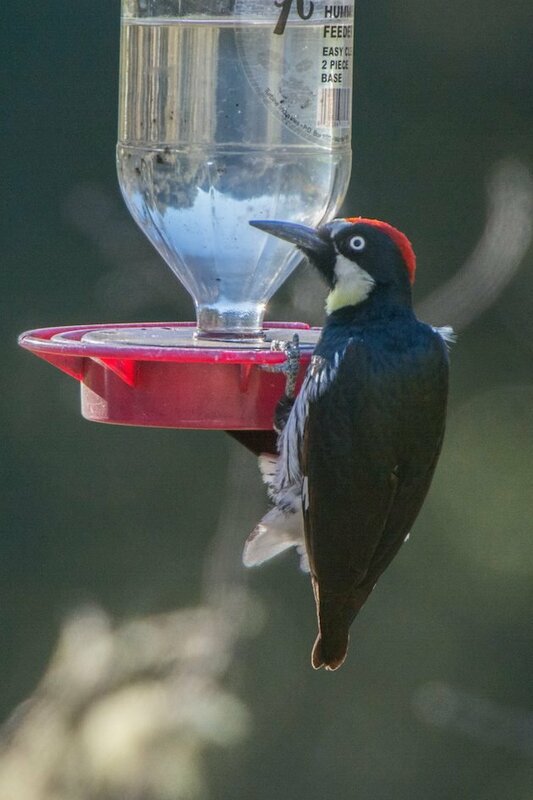 It is interesting that I have never had the Acorn Woodpeckers even approach my hummingbird feeders. I can imagine what a mess they could make by tipping the feeders causing them to leak sugar water all over the place. What a nightmare! I did experience an Anna’s Hummingbird feeding at a sap hole on an oak tree several years ago. We routinely had downy woodpeckers at our hummingbird feeders in Maryland. Some years, more downies than hummers. I agree with Tom on this one. First thing I thought of was a local Sapsucker that riddled a Cherry Tree looking for what amounted to “sugar water”. Observation of birds have noted a instinctual balance in what each species needs for a balanced diet: High protein grubs, check, simple carbs, check. I live in Santa Rosa, 50 miles north of San Francisco, and I have had Downy Woodpeckers at my hummingbird feeder, but never Acorn. 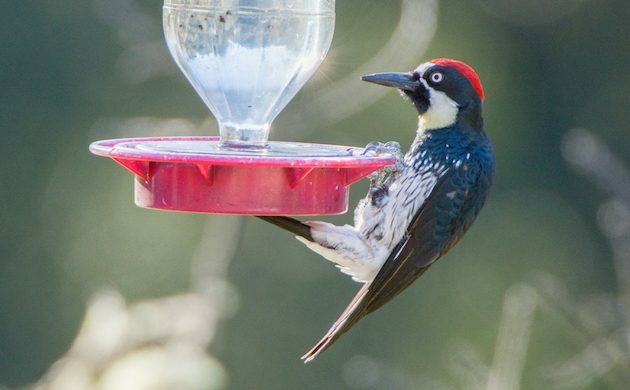 Do you have other bird feeders in your yard as well? I live on the Calif coast 50 mi N of Santa Cruz. I have 5 qt hummer feeders and have taken the rosette off of one hole for the Acorn Woodpeckers, 4 of them. BUT my question is – does anyone still have Allens hummingbirds at their feeder? They usually leave here by the 1st week of July, arriving in January, but I have 3 juveniles who are still here. Do you think global warming is confusing them? Climate change is definitely affecting the Allen’s Hummingbird. By 2080, this hummingbird is expected to lose 90 percent of its current breeding range, according to Audubon’s climate models. I live in Shasta County, in the northern most area of the Sacramento Valley, in the foothills. I have Anna’s Hummingbirds here year round. You can check out the range maps for Allen’s Hummingbirds here. It appears that their year round range is currently around Santa Barbara southward. 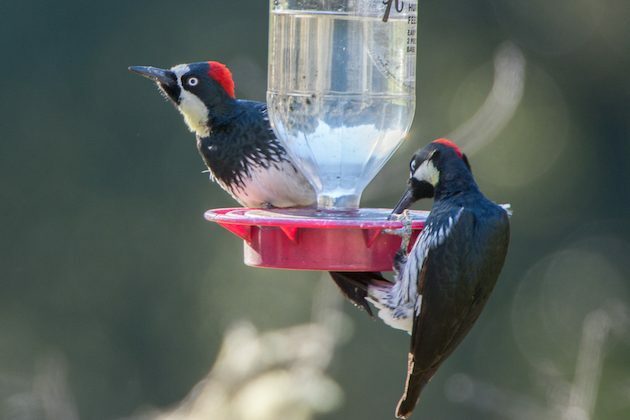 You may want to check with the Monterey Audubon Society, to find out what other local birders are experiencing. Week 11: back on the road, Twitching at this point.